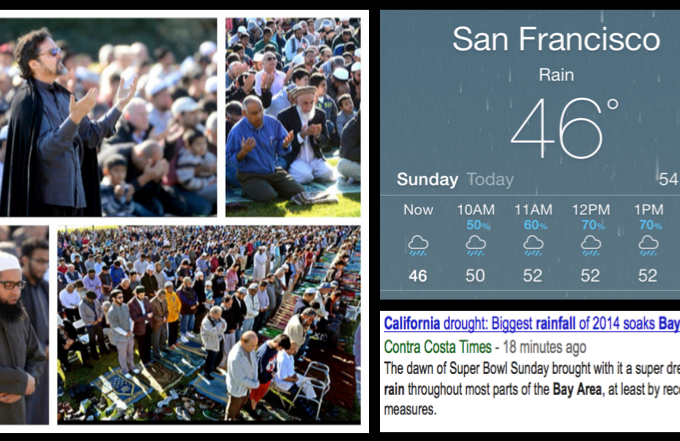 Social media is abuzz with the large congregational prayers for rain (salat ul-istisqa) held in Bay Area under the patronage of Imam Hamza Yusuf, Imam Zaid Shakir, Imam Tahir Anwar and other esteemed scholars. Most Muslims already know and are greatly pleased by the response from the heavens with rain showers hitting the Bay Area soon after the prayers, and grateful. And there is no doubt that such events help renew faith and trust in power of prayer. However, what we are not talking about enough is a more enduring back-story—Muslims taking center stage in sponsoring an event that affects their entire community, regardless of faith. What the prayer for rain did was to bring out Muslims in large numbers as a united community, leaving behind the internal politics and squabbles that Muslim organizations and masajid are beset by. Amazing opportunity for dawah. How may times have we heard that a million speeches and presentations will not have the affect that walking the talk does. Gathering as a community for a cause that affects all the people in the area with no catches, no Muslim cards, no conditions presents Muslims, as truly concerned for humanity- as they should be. The obvious reason—rain after salat-ul-istisqa. Believers don’t need evidence for their faith, but believers can only have their faith renewed, refreshed and enhanced by seeing these minor miracles. Even Ibrahim asked his Lord to show him how He brings to life the dead, not because he didn’t believe but to strengthen his faith [Quran 2:260]—the faith of one called “Allah’s close friend”. While we have had countless events on issues affecting Muslims around the globe, like Syria, Palestine, etc. (no doubt also important), we have generally been negligent of our responsibilities of giving back to the communities we live in, of remaining as the “others” in the society. As I discussed in my article on cognitive dissonance, the “other paradigm” may be a large cause for the media/public double standards towards Muslims. What is the “other” paradigm? 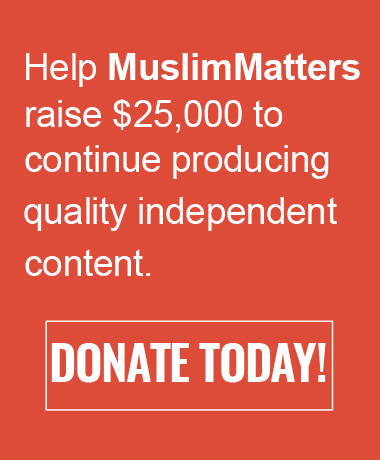 Acclaimed Muslim intellectual Tariq Ramadan has gone at great lengths describing it, of Muslims’ reliance on an “external” Islam, fraught with cultural baggage, leaves them feeling inadequate in their own faith, leading to alienation from the larger society. God is greater! It is wonderful to see this prayer on such a large scale. I have read about it but never participated in it as there was never a need in the locality where I live, but to see it in action and the rewards is amazing. This happened in Doha, Qatar as well recently. There were prayers in schools and mosques. Results were similar in that it rained. I am really pleased by this. I hope Muslims start engaging in more activities like this besides doing oral da’wah. Those who doesn’t live here can’t fathom the dire need of rain on california subhanallah. Last time we had drought that lasted for 20 years ! this time its supposed to be worse ! I am so glad that you did the prayer , I wish every where in california they would keep doing it . It is so important. Already the state are getting ready to conserve , all the food and specially water prices will soar soon , hundreds of farming are cut from water supply as each county embrace to conserve water to their community. the LA county has reserved water, the amount is equivalent to the water inn an olympic swimming pool . I am honored & humbled that Allah has responded to us sinners. I will play a little “devil’s advocate” here. The formula you seem to be proposing is: Group prayer for rain. Rain comes. Faith in prayer is increased. What really happened here was that a group of people praying “beat the odds.” The likely result of this is that there will be more similar activities of group prayer for rather insignificant causes. When those prayers are not answered, will faith then be similarly decreased? I am reminded of the “psychic” Jeane Dixon who made hundreds of whacky predictions. One comes true and she is lauded as a great prognosticator, with everyone forgetting all the predictions that did not come true. Do we really wish to link our faith to the results of public prayers? 1) Prayer for rain is an established sunnah. It’s not insignificant. 2) Allah is the Knower of everything. He knows what we need, He knows what we want to ask and what we will ask. As such, prayer is an expression of our need and a way to make our hearts realize the reality which is that all is subservient to Him, including rain. 3) Allah is powerful of everything. Did He send the rain, regardless of whether people prayed or not? Yes, He did. Did He allow the gathering of people to pray for rain? Yes, He did. As such, is it possible that the two are linked? Obviously, yes. 4) Nobody’s linking faith to results of public prayers; however, everything is a sign for a believer. If this is a means for strengthening one’s iman, then why not. – This tradition of group prayer is SPECIFICALLY for rain and it was established and prescribed by Prophet Mohammed and it is’nt something new that was invented recently by a random group of muslims. It is only performed in the case of a drought and not for any other purpose. – Either you believe in miracles or you dont! – For believers in the power of God Allmighty, , EVERYTHING is a miracle. Not just rain after a group prayer..
Or he could think ” I just got lucky!! This perfect ,cute kid is MINE!” . Even if something goes wrong or does’nt work out , believers KNOW that THIS was God’s original plan and whatever BAD happens , is not because SOMETHING WENT WRONG, but because it was MEANT to go wrong for a reason and ultimately that it is for something good. Whereas a non-believer will just have to say “Tough luck” ! 1. They either get answered. 2. God removes some other difficulty from your path in this life. 3. You are compensated for unanswered prayers in the next life. So it’s true we pray all the time, individually and in groups , ONLY because there is nothing or nobody that can help us with any significant or insignificant thing, except God Allmighty. Not just the rain after a group prayer. For a non-believer NOTHING is a miracle. It’s just “beating the odds”. He will dismiss every miracle , small or big that he experiences as just a matter of chance. this is a matter of faith, not as much of logic. And the crux of this article is about other social matters, not about the prayers being answered. 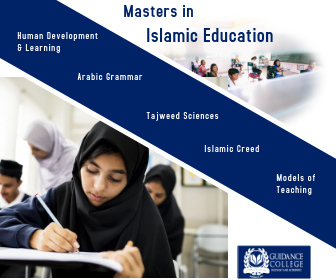 We believe our success is in carrying out the command of Allah as shown to us by the prophet Muhammed (saw).By merely carrying out the command we have attained success. Nice Article! Please keep it up. Next Next post: A Lion is Born|Part 5: Wedding? What Wedding?